another pic in robot mode. 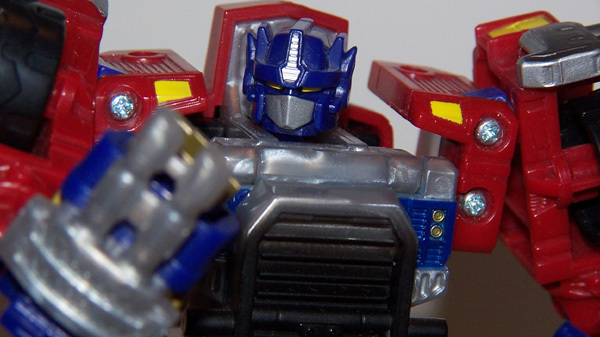 Bio: Truth, justice, freedom... to Autobot Leader Optimus Prime these are more than mere words-they are the Primus-given rights of every living creature and the very things that Prime would sacrifice his own life fighting for. 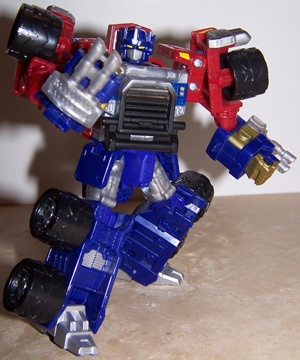 Having received the highest possible honors during his tenure at the Cybertronian Military Academy [see Institutions], Optimus Prime was the youngest cadet to have ever been promoted to the rank of active Field Commander prior to graduation. 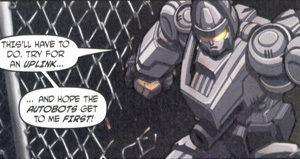 Since then, Prime has selflessly dedicated his existence to the eradication of the Decepticon menace, and was responsible for leading the counterstrike that repelled their first major assault on Cybertron. With the Decepticon advance temporarily halted, Prime was asked to adopt the mantle of Guardian over the Autobot province Cyber City and it was under his guidance and watchful optics that the entire planet was allowed to enjoy a new era of peace and tranquility. 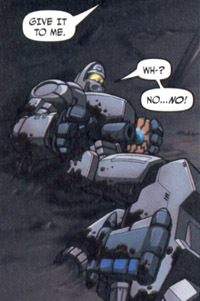 However, this peace would be short-lived thanks to the resurgence of the Decepticon movement. Led once again by the despot Megatron, the Decepticon forces would return wielding the power of the Cybertronian subtribe known as the Mini-Cons. Despite waging a seemingly endless war against the Decepticon forces for millions of years, Prime's devotion to the Autobot cause has yet to falter. It's this dedication to his ideals that not only inspires the undying loyalty of his soldiers, but also instills fear into the sparks of any who would try to subvert those noble principles. 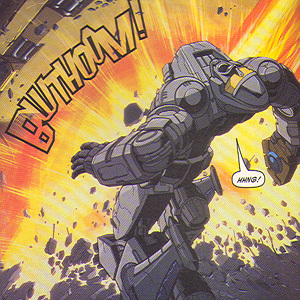 Weapons and Abilities: Subject is one of the largest and most physically powerful of all the Autobots. 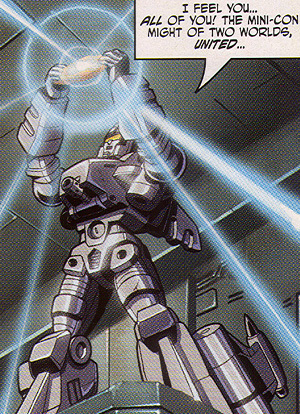 Having served under the tutelage of Scavenger, he has become proficient in many forms of Cybertronian self-defense, as well as the use of most standard issue Autobot firearms and ordnance. 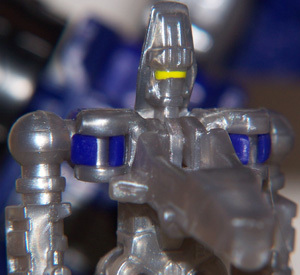 Additionally, Subject is capable of entering an enhanced version of the Powerlink process known as "super-mode." 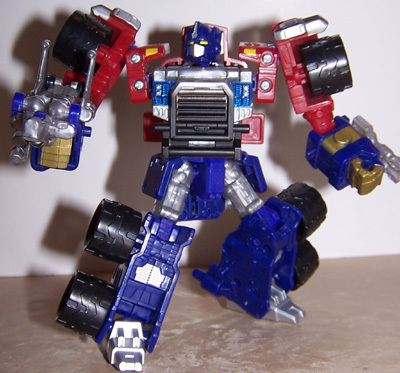 In super-mode, Prime is able to combine with the components of his trailer, thus making himself larger and more powerful [see Super Optimus Prime]. This superior form provides Prime with increased strength and endurance, as well as other enhancements including, but not limited to, energy projection and manipulation. 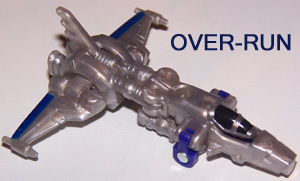 Subject is also capable of upgrading this mode further by linking with other Autobots such as Jetfire and Overload. Weaknesses: Subject shows no physical weaknesses; however, his selfless nature can sometimes be used to his opponent's advantage. 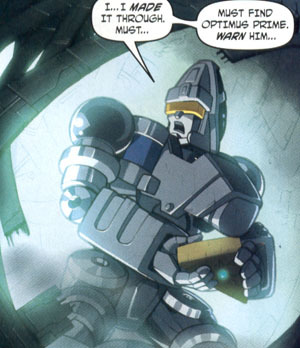 "To understand your adversary... you must first understand yourself"
Other Appearances: Over-run has in a slightly 'evolved' form has made several appearances in the TF Energon Comic series by Dreamwave. 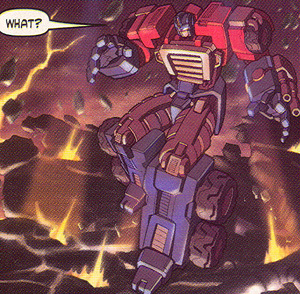 I cannot think of any other forms, or TF characters with the same name. A stranger in a strange land... I guess that's the best way to describe this enigmatic Mini-Con who continues to constantly surprise me. When Over-Run first came to our attention warning of infinite worlds and multiple realities, many of us were skeptical of his claims, to say the very least. However, we were quickly converted with the impending arrival of the being known as ~ and its hordes. 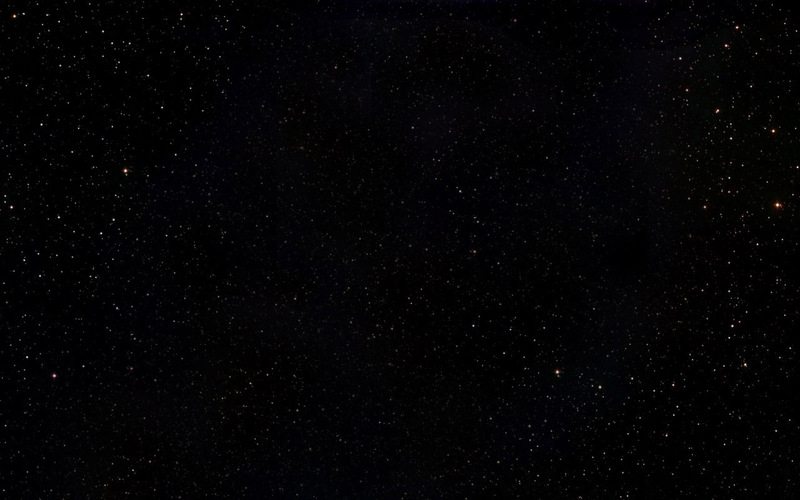 Without the guidance of Over-Run, Cybertron-and this entire solar system, for that matter-wouldn't have been able to survive the onslaught of the ChaosBringer's attack on this reality. What impresses me most about this Mini-Con is his continually expanding intellect. Though it may be slightly eerie at times, Over-Run seems almost prophetic, slowiy evolving from a panic-stricken scientist to something of a mystical sage. 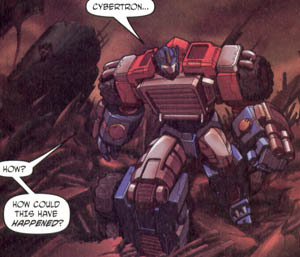 He now shares an uncanny bond with the Cybertron of this reality and seems to be slowly helping it repair itself. As the effort to rebuild our world continues, it will be interesting to see how the fruits of his labor develop. 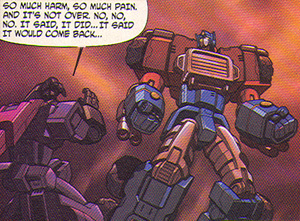 However, I fear that even OverRun's assistance may not be enough to fully heal the wounds that our world has suffered at the hands of Unicron. Weapons and Abilities: Like many of his Mini-Con brethren, Over-Run is a "triple changer:' capable of transforming into three different modes. 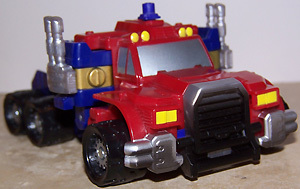 Besides his vehicle and robot mode, Over-Run also commands a weapon mode: a surprisingly powerful high energy photon blaster, which can be wielded by standard-sized Autobots such as myself. 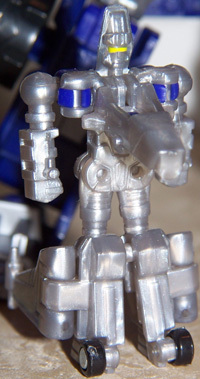 Weaknesses: I am more than a little concerned that Over-Run's growing attachment to the inner workings of Cybertron is slowly causing him to loose touch with his fellow Mini-Cons and Autobots, many of whom are beginning to question his mental stability. 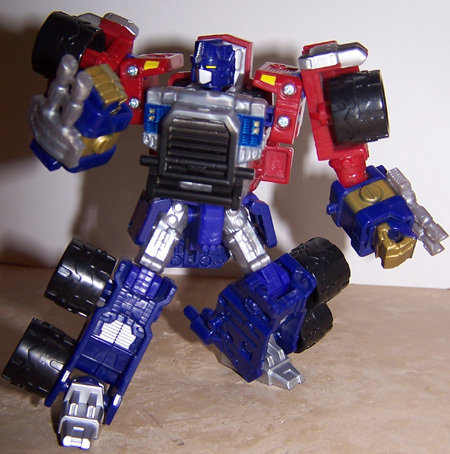 Other Appearances: Holy cow there have been a few other Optimus Primes! 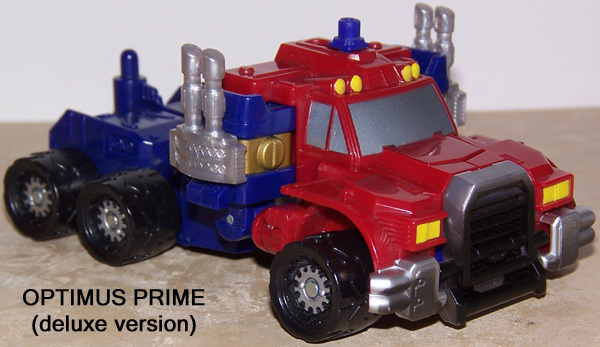 1987 a Power Master version, no CP yet! 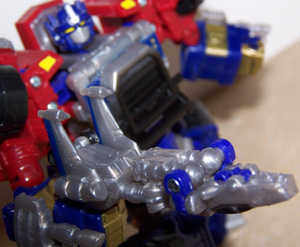 The Beast Wars began in 1996 followed by Beast Machines in 2000 And with it, a character many fans related to Optimus Prime, called Optimus Primal. Considered to be a different individual than the original O.P. I won't go over every version here.